Scrum Methodology: How it is race winning process? Nowadays market is changing extremely fast so it has become important to be adaptable. In this competitive world, especially in the domains of IT industry like mobile app development and website development, if you want to take the lead then you must provide customers with what they need in a productive and cost effective way. To beat the competition out, we cannot follow the old clumsy way to develop the product, especially software products. Agile Scrum methodology is a project management framework in which a work is done in a planned way. Agile and Scrum methodology breaks one complex task into manageable small tasks which are quick and easy to understand. With Agile Scrum methodology, the website development and custom mobile app development company gets to work closely and collaboratively with the fellow team members and the customers too. Once you understand what actually is Agile and Scrum methodology and how it works, it will be easy for you to accept it in your respective organisation. What is scrum and agile methodology? Anybody can do work using an agile methodology, it should just be in an organised and disciplined manner. Agile is a method to build a project like software development brick-by-brick. 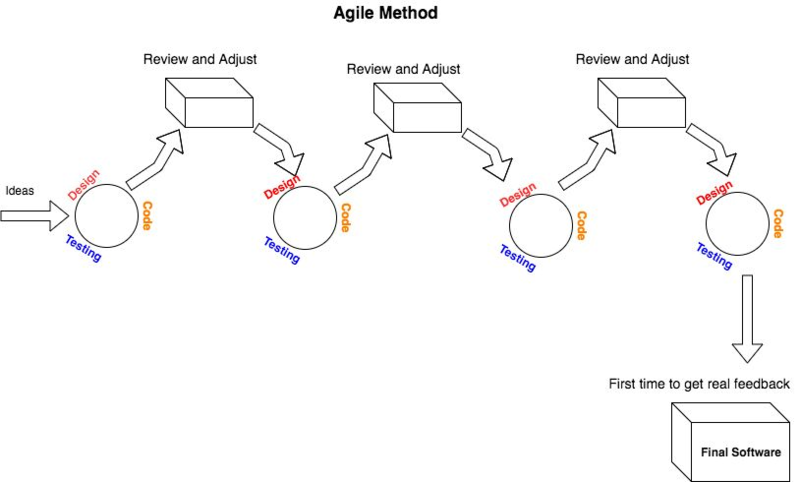 In agile method, the project is divided into small time frame like 1 to 4 weeks. Some portion of the project will be developed in the first 4 weeks and next part in next 4 weeks and this time frame of weeks is termed here as “iterations”. Demo and review of the project is done after each iteration of work, this makes the final product error free as each iteration is being reviewed. Regular demo and review helps to keep a bird eye on the process and can easily point out things to be worked more on. In scrum model, a project is divided into different sprints and each sprint is of max 1 month. Scrum is a subset of Agile model. When you have a big complex project, then the scrum method role comes in. Here the team makes a list of features or tasks to be performed in a particular sprint. When the implementation, design, coding and testing is completed in one sprint, a evolving project is made in the end. We at LetsNurture, a leading IT Outsourcing company, follow the scrum methodology for the projects and there are quick and simple steps to be followed. We are so confident about this method because we all at “LetsNurture” follows this framework. On each day of sprint, we attend a daily scrum meeting with the project lead, the manager (Scrum master) and fellow team members. Scrum meeting is helpful because the entire team discusses about what they have worked on prior day, what they will work on that day and what are the things they can follow to speedup the progress. At the end of each sprint, the stakeholder reviews the product and provides their feedback on it. Detection of problem at early stage. The final product will meet up to the client’s need. Easy to measure the productivity. Leads to continuous improvement in product through regular sprint review with stakeholders. Being in touch with customers throughout the project gives them higher satisfaction. With every sprint, the product gets better. There is a discipline in the work process. These are few major benefits of agile scrum methodology which you cannot ignore even for once. Sprint Planning and Sprint Backlog Creation Determining the sprint duration and total sprints in a process. Working on the Sprint To track the current working process. Team member will tell about the task they have finished, the task they will do next and what problems they faced. Testing and Product Demonstration Every sprint product will be reviewed and tested for quality assurance. The aim of this article is to spread knowledge about the main purpose of the Agile Scrum process and to make aware that there is a best way to work on a complex projects for custom mobile apps and website development. We personally believe that the productivity is being improved with the Scrum process. In the above article we tried to show why we should use Agile Scrum framework and how we can use Agile Scrum framework. If you want to share your thoughts, follow @letsnurture on Twitter, we will be happy to chat with you and answer your queries. For any other information please feel free to submit through the inquiry form.